The best time to get the Chase Ink Plus is… maybe later! A few weeks ago I realized I hadn’t opened a new card for almost two months, so I decided to do something about it. Chase business had denied me for cards in July 2013 and again in January 2014 while approving Bonnie’s applications about every 6 months. The difference? She didn’t call. And like clockwork, each time about 10 days later the new card arrived in the mail. Now of course if you get denied you’d want to call in for reconsideration, but I recommend allowing all Chase business applications to work through the system. I don’t know, is it a good deal? Picture stolen from TBB. This Ink Plus offer IS a pretty good deal. We even put Bonnie’s referral link on our credit card links page. But let’s look at it compared to my new United business card, which I was bummed about my poor timing on for about, oh, 11 seconds, when I first saw the 70K offer. I get 50K miles for spending $2,000 within 3 months, 2 miles per dollar at restaurants, office supply stores and gas stations, and 10K bonus miles for each calendar year that I spend $25,000. Along with other small benefits when flying United and the huge benefit (for family travel from a small airport) of expanded XN class award seat availability. All with no fee for the first year. With the Ink Plus, I’d have gotten 70K UR points for spending $5,000 within 3 months, 2 points per dollar at gas stations and hotels and 5 points per dollar at office supply stores and phone/internet services. But we already have 3 Ink cards in our house and office supply promos that make manufactured spending profitable there seem to have dried up for now, so an additional Ink card wouldn’t make any difference to our 5X earning potential. The first year fee of $95 is not waived, so I’d have had to pay that. This is where it gets a little sticky. Assuming I need to beef up my United mileage balances (I do) and I’m willing to MS (I am), which offer is better? Currently, the least expensive way for me to MS outside of 5X drugstore category bonuses is by using AMEX gift cards purchased through cashback portals. So regardless of which card I got, I’d be MSing at the AMEX gift card store to earn those United miles we need. I’ll assume 1.5% cash back through cashback portals (it has been as high as 4% and as low as 0% within the past year, but there has been at least 1.5% offered nearly the whole time) and 1% cost to liquidate the gift cards. Remember all MS is local, and not everyone has the same liquidation options for AMEX gift cards. If you don’t already know what options work for you, spend some time with our Illustrated Guide to MS. Simple step-by-step stuff. With my United business card, I can spend $25K this year and another $25K in 2015, cancel after 11 months and earn 120K total miles along with $250 profit after paying fees to liquidate my AMEX gift cards. With an Ink Plus card, the same $50K spending on AMEX gift cards would have resulted in earning the same 120K miles. But I’d be $95 short at $155 profit since the first year fee isn’t waived. Without the UA offer, if I’d gone for the Ink Plus with the standard 50K bonus I would have had to do 10 or so additional trips to various stores to get to 120K miles, $70K total, but I’d also have an additional $200 to show for it. Note this offer is also available for the endangered Ink Bold charge card, which makes sense to get if you can since it seems to be going away. Well then, let’s just go the Visa Savings Edge, Ink and Staples combination. That should cut down on the MS needed. It does, but at a cost. To get to 120K UR points, we’d be out $245 plus the $95 annual fee. Recouping that money and getting even with the $250 profit from the UA business card would require another 20K in staples MS. If we went ahead and did all 50K at Staples and maxed out that category bonus, we’d be ahead by $590 in points. So that’s definitely a reason to keep the Ink plus in mind for 6 months or so from now. Another route we should compare is getting the Ink Plus, doing the 5K there and then using a card with a 5X category bonus like the Old Blue and simply buying the miles with the cash earned. So we’d need to buy 45K miles which at 2.3 cents (a common promotional price) would cost$1035 of the $1800 than we’d earn on 45K Spending. Then we’d be at our 120K miles with $920 profit after all the fees. This is the winner, right?! If you live in an area where MS is difficult, or you don’t have time to scale that kind of MS, the Ink Plus along with cashback is definitely the winner. But if we did that we’d be cutting into the amount of cashback we get to keep, since we’ll be doing as much on our 5X cards as cards as we’re comfortable with either way. For us, it’s yes, get the miles AND max out the cashback. For you it may be miles OR cashback. There have also been several 60K Ink Plus offers over the past 15 months, with the first year fee waived. THAT is the best Chase Ink offer ever, over the current 70K offer! Matt at Saverocity wrote about paying $95 for 10K UR points here, check out the lively discussion in the comments. But all of the arguments in favor of paying $95 for 10K points which do not have a guaranteed travel value over $125 ignore one thing: that’s a silly price to pay for UR points! 10K UR points cost $49.50 at the gas station, $49.00 at Staples or negative $50 via AMEX gift cards. I don’t usually go out of my way to buy stuff for far more than I can get it elsewhere. Least of all points that can be devalued! 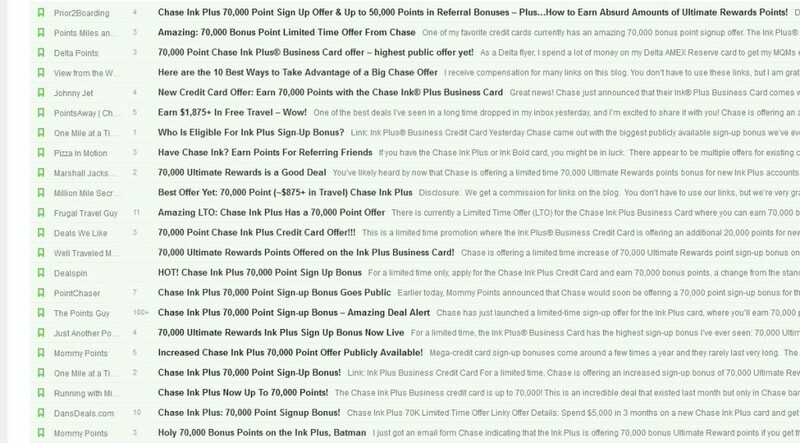 So if you managed to ignore Chase’s huge marketing push for the Ink Plus card over the past couple of months and are on the fence about it, there’s no hurry. 70K offers will be back. And 60K offers will be back, and may even be a better deal! I’m afraid we may see a shift away from offers with the first year fee waived, but that’s not here quite yet. What do you think? Of course I couldn’t switch my application if I wanted to, but I think the UA business card with 2X miles at gas stations and restaurants and an additional .4 miles per dollar on all spending for $25K winds up being the best choice for our needs. As always, one size doesn’t fit all. Not even 70K! Disclosure: The cards mentioned in this post are business cards. If you don’t have a business, they aren’t for you. If you have credit card debt, they definitely aren’t for you. All credit card links in this post pay us nothing if you use them. Some of the cards on the Credit Card Links tab do give us a commission or referral bonus. Yes, UR points can be devalued too. What’s your approach to “1% cost to liquidate AMGC”? Primarily various Vanilla Visa products from pharmacies. Along with the occasional Paypal reload or similar. I know some folks have a harder time than others liquidating these. Think local!